It… is… aliiiiiivvvvvveeeeee! Since the original novel’s release in 1818, Mary Shelley’s creature has seen countless portrayals and appearances in plays, movies, books, and pretty much every medium imaginable. The Frankenstein monster has become a horror and gothic cornerstone staple. It’s arguably the most recognizable monster in the history of horror films. Everyone one knows who the monster is the moment they see it. 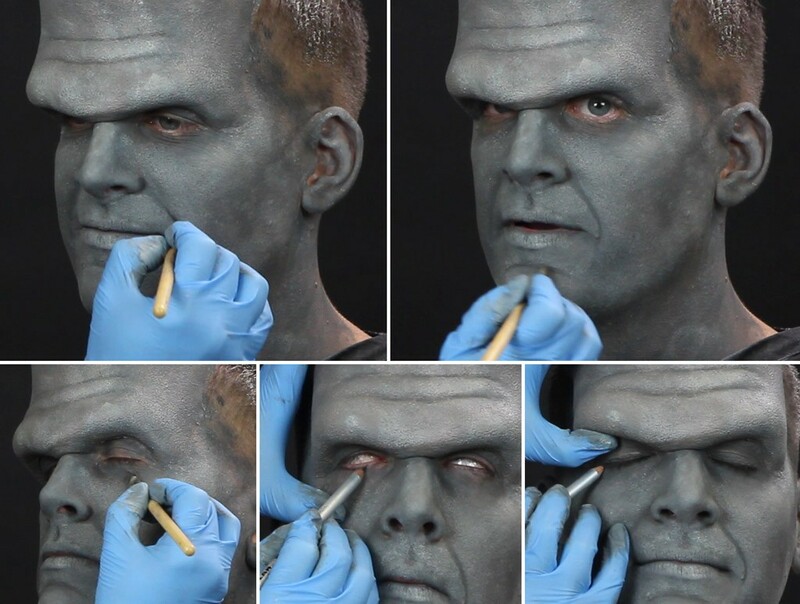 Now, when Halloween rolls around this year, you can complete the classic Frankenstein look with this easy to follow makeup tutorial! 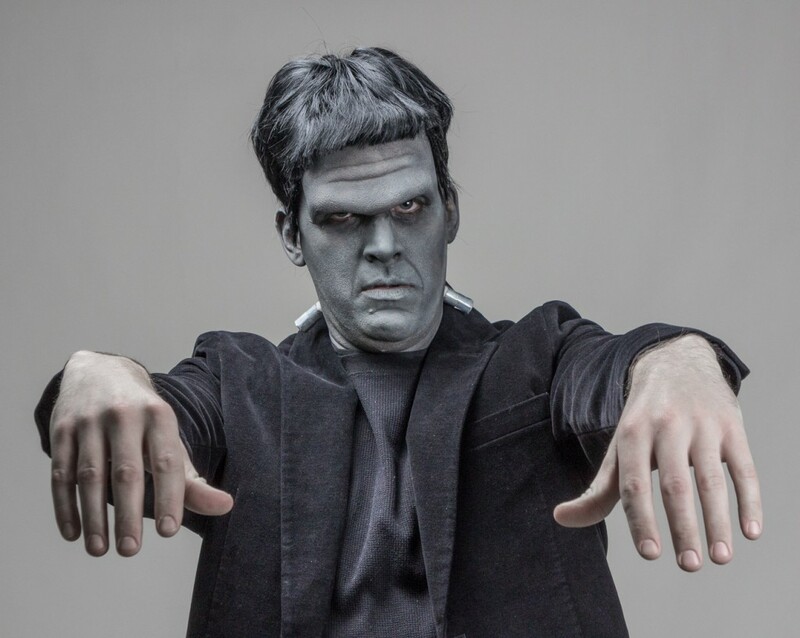 Inspired by Boris Karloff from the original 1931 Frankenstein film, this makeup look goes vintage in only black and white. 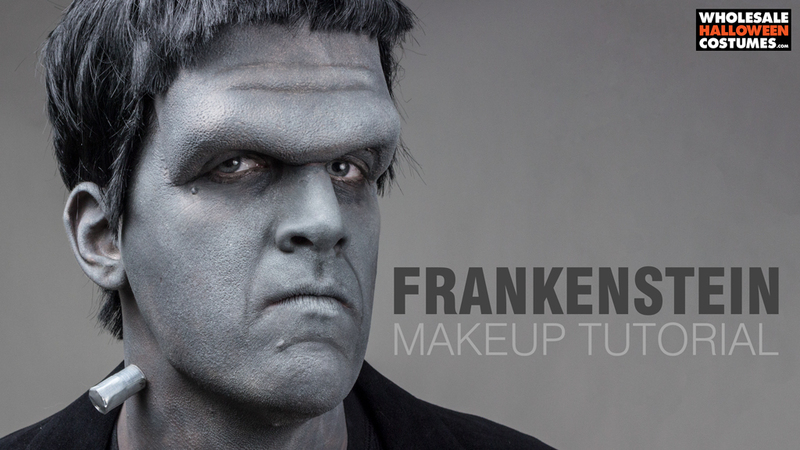 Follow along with the step-by-step breakdown so you can take the classic Mary Shelley monster and take your costume look back in time- Frankens-time! 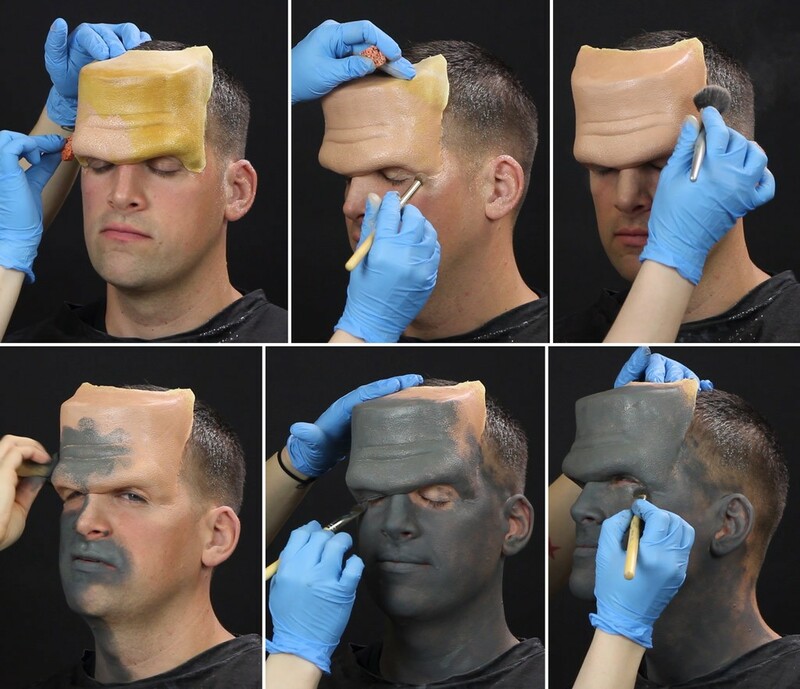 Start by choosing where the foam Frankenstein Forehead will be applied. 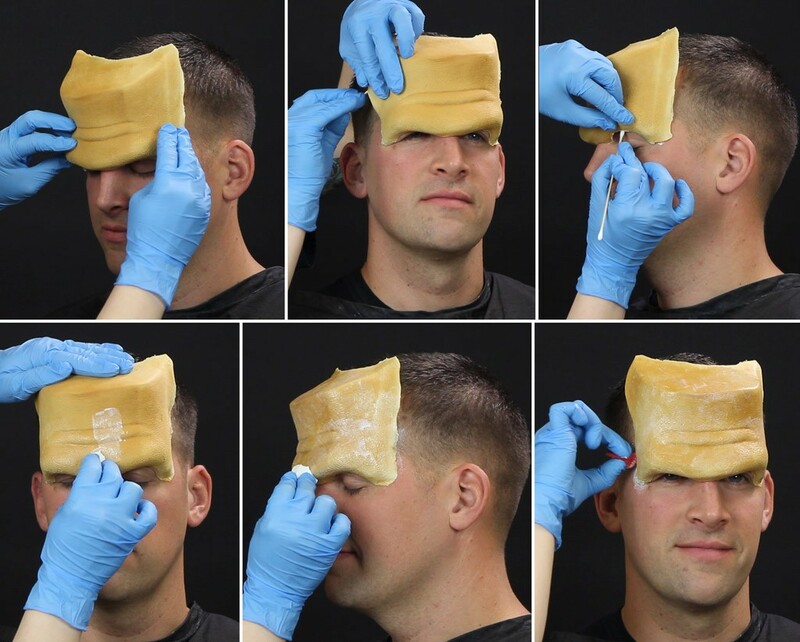 Using the skin-safe adhesive of your choice, start gluing the appliance to the model’s forehead. Take extra care with sealing down the edges of the prosthetic- a cotton swab worked well to get adhesive under hard to reach spots. 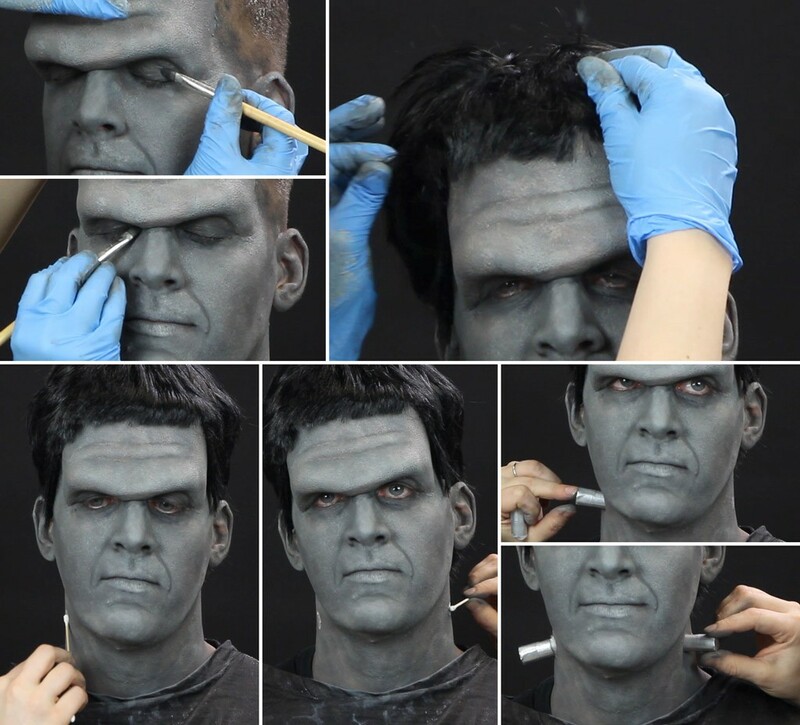 Once it is completely glued to the face, sponge liquid latex over the entire prosthetic and around the edges to help hide them even more. Apply foundation over the prosthetic that matches the model’s skin. Dust with powder to set the foundation. 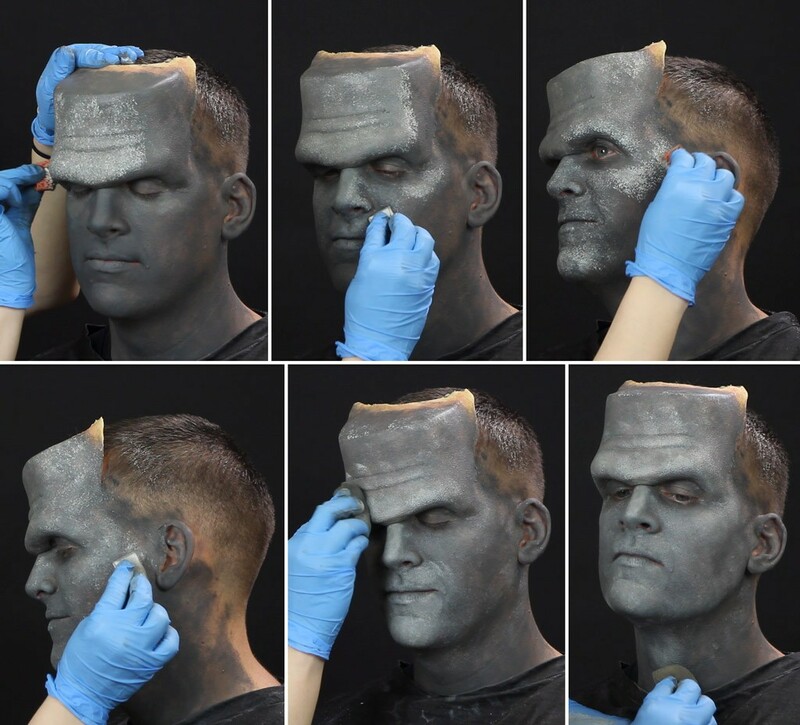 Sponge a medium dark grey makeup completely over the prosthetic, face and neck. Use a brush to get full coverage over the eyes. Using a rough sponge, begin stippling a very light grey makeup over the entire look, but concentrate the most pigment on the highlight areas- forehead, cheekbones, bridge of nose and chin. A light touch and layering are key. Using a dry smooth sponge, go over the stippling to help mute the effect. With a brush and grey shadow, add depth to the wrinkles and sunken features of the face- enhance the laugh lines, the hollow under the lip, the upper and lower eyelids. Line the upper and lower lids with a soft dark grey line. Give the eyes another layer of shadow to make them look even more sunken. Put on a short black wig. Apply the bolts to the neck with adhesive. We made bolts our of duct tape. See how to make your own prosthetic. Pin this now to guide you later!